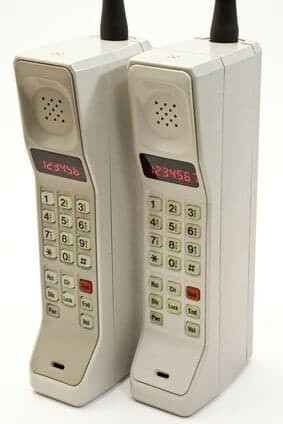 Today is the 40th birthday of the mobile phone; happy birthday mobile. The first mobile telephone call was made on 3rd April 1973 by Martin Cooper an employee of Motorola in New York. In those days, you were lucky if you got more than half an hour talk-time out of your phone’s battery. You also needed a handbag-sized battery pack, which you carried over your shoulder, to keep your phone working. And if you wanted to use the phone in the car, you had to buy a second one which was permanently wired into a box that fitted into your boot. You then plugged your hand-held into a socket in the front of the car and the two phones worked as one. I know – I had one…! Mobile phones have come a long way since those early days – and the pioneers at Motorola? Well the company is now a subsidiary of Google and is not doing as well as it once was. Apple and Android now dominate and even the king of mobile, Nokia, is not what it used to be. Things have changed in the world of mobile. But how long have those changes taken? 40 years. These days we use mobile phones for all sorts of things in addition to phone calls – social networking, buying things, storing useful information or sending emails. But each of these things have been added relatively slowly; we have been able to send emails using mobiles since 1993, for instance. Although many people now accept smartphones as a “normal” part of their daily life, our brains have had time to accept them because the developments have taken place relatively slowly. That is changing, however. The pace of change is at its fastest ever during the 40-year life of the mobile industry. A new phone was launched recently which can check your pulse, take your temperature and provide your doctor with up-to-date medical information to help monitor your health status. Researchers in America are working on “emotion sensors” which could be added to help transmit your feelings as well as your words. It is, though, the world of social networking which is helping the mobile sector pick up the pace. If you have an idea for an app today, you can find a developer on one side of the world who can find a designer on the other side of the world all before tea-time. Back in the days of development at Motorola that kind of search would have taken months. It means that nowadays new ideas and products can be produced much more quickly than ever. It means that the next “thing” after mobiles will not be here within 40 years; it could be just 40 weeks. The question is, is your business ready for that?